A walkable community suddenly has become attractive to people in their twenties and thirties, who are no longer enjoying the expense and hassles associated with owning a car quite as much as their parents did. Walking as transportation can make a dent in our collective energy use. Walking is an enjoyable and sociable way to exercise, and an efficient way of completing a relatively short trip, especially where parking is challenging. Walkability tends to be highest in the older parts of most cities, where the streets form a grid pattern, and cul-de-sacs and dead ends are less likely to occur. An exception would be new urbanist greenfields developments where walk time is a key factor in design decisions. A walking community has the advantage of being able to connect with other transportation systems and recreation possibilities. We recommend the book Cities for People for any city planners, designers, or citizen leaders who may be stuck in the past in thinking transportation is only about cars. The social benefits of promoting a walkable community are great. We mean not only just having fun, but also building of social capital, or the relationships necessary to form trust in a community. In lower-income communities, get people moving by forming walking clubs and perhaps setting up a discount program with a local store for some decent quality walking shoes. Communities and neighborhoods built before World War II tend to have sidewalks on one or both sides of the street. In these areas sidewalk maintenance is the major challenge. Some municipalities place the burden of sidewalk repair on homeowners, while others shoulder that responsibility themselves. But keep up the pressure to maintain sidewalks, as it's important that we have many ways to get around. Time, frequent heavy truck traffic over a sidewalk, or growing trees whose roots push up the sidewalk are common factors in decreasing the functionality of sidewalks. Many suburbs or new towns built after World War II in the U.S. never had any sidewalks. These areas should prepare a plan for how to build out sidewalks wherever street widths and lawns make such a program possible. Begin with the most important streets in the street hierarchy, but also prioritize streets that would make a convenient walking route between shopping, educational, and recreational destinations. If you hang around community work very long, you will hear something about "pedestrian scale" and how pleasant it is to be able to walk through a business district where the street lighting is down low enough that it lights the sidewalk rather than the wider area illuminated by the highway-oriented taller street lights. Pedestrian activity is a key goal of commercial district revitalization. Impulsive shopping obviously is a benefit to local shops, but also adds to the liveliness of the area even when no purchases are made. People are interested in people, so the more foot traffic, the better. But of course for the pedestrian scale to be an advantage to your business, you have to have pedestrians. And they really don't want to get their shoes muddy, have to walk in the street for half a block where there's no sidewalk, or trip over the sidewalk section displaced by tree root upheaval. Where there's a sidewalk network, repair and maintain it. If there are a few missing links, correct that if you want a walkable community. In many states, a special assessment can be levied to pay for sidewalks. While this places the financial burden solely on homeowners ultimately, of course this is a fair way for municipalities to be able to afford to finance and oversee sidewalk projects. Where residential areas or strip malls were developed with no sidewalks, your journey to a walkable community will be tougher. Lobby your municipal government to figure out a plan to install the walks. In retrofit situations, commonly you'll have to settle for walks on one side of the street only. Installing sidewalks will subtract from either the street or the yards, but most streets can withstand what is known as a road diet (a cute term for making the street more narrow). To assess whether it is practical to convert driving area to sidewalk, you would need to consider the frequency of on-street parking, the amount of traffic, whether there are certain congested times of the day or week, and other visibility and safety conditions along the street. If traffic is low, such as on many residential streets, the street itself may well have been overbuilt. If you are a walking advocate, try to convince your local government that walkable communities are the way of the future. Probably an even greater problem than lack of sidewalks is the lack of connectivity of many post-World War II streets. The privacy of a cul-de-sac was presumed to be highly desirable. Unfortunately it also means that the walk from Point A to Point B may be three times as long as the straight line distance between those two points. Your neighborhood should become serious about being a walkable community, for the sake of preventing childhood obesity if nothing else. If you do, then you need a planning process for how to deal with the cul-de-sac effect. In brief, the solution lies in obtaining easements or outright purchases of property by the local government to allow walkways to be installed between two houses. In many places one pair of houses on the cul-de-sac can spare the room, although often it's going to be a fight. You will need to make walkability a campaign with some popular support before you even approach property owners with any such idea. If you are able to institute a program of improving your walking community appeal through new sidewalks and new walkways connecting the cul-de-sacs, you need to publicize the improvements so people have an idea of where they can now walk. But it's not just minor streets where walking is a problem. The arterial streets (a name for the largest streets for cars) often make little to no provision for walking. Pedestrian amenities of many sorts should be included on all streets, with the amenity factor becoming greater, not less, as the street size increases. See our complete streets page for more on this topic. 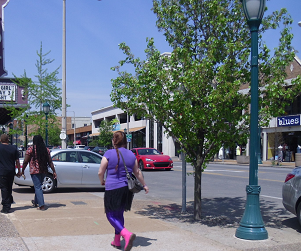 Many states provide for special assessments of taxes on a benefits district that creates an amenity such as sidewalks. Ask your city attorney about this, and organize your neighbors to request sidewalks, even if you have to pay for them over a several-year period. The first season sponsor organized walking events that can turn into fun community events. Leave from a park or school where people can fill their water bottles, and perhaps provide a snack or ice cream at the end if you have an organizational sponsor. The organized walks may be a way to build momentum for a capital investment program featuring new sidewalks and walkways also. If people in your area are afraid of crime as they walk, the group activity could help ease that fear. This is especially important in making it possible for the older and more vulnerable citizens to participate in this activity, which promotes fitness and healthy socializing too. You also will want to look at major barriers to walkable community goals, such as wide high-speed roads and possibly railroad or industrial passages where the footing does not seem sure. Your neighborhood creek, although a terrific potential asset, also can serve as a barrier for getting around. So look at whether a pedestrian bridge over a major highway, creek, or grouping of railroad tracks would make people feel and be safer. Could you connect your immediate neighborhood of concern to a park or other amenity if you had a safe passage? An underpass also is possible in many situations, including under many bridges over streams. Also do not underestimate the seriousness of broken or heaving sidewalks, subsiding sidewalks that therefore accumulate puddles and debris, and small lengths of missing sidewalk in deterring walking. Shrubbery growing over the sidewalk also can make it difficult or unpleasant to pass by. Another barrier to walking that is not discussed often enough is just plain speeding by motorists. Imagine the difference between walking along a street with cars passing by at 45 miles per hour, compared to 35 miles per hour. Or imagine the feel of being passed by a car traveling at 35 miles per hour when the speed limit is 25. So if walking becomes an active transportation priority for your community, give special attention to speed limit enforcement on your prime streets for walking. The last of several possible barriers we will discuss is perceived threat of crime. Where people do not feel it is safe to walk, only those who are without other options will become pedestrians, and they will hurry through with no real enjoyment of the experience. So if you live in a crime-ridden neighborhood, you are living in a downward spiral in which people don't walk because it doesn't feel safe, and it doesn't feel safe because no one is out walking. To the extent possible, your neighborhood might be able to implement some CPTED (Crime Prevention Through Environmental Design) solutions. If you live in such a neighborhood, you may want to read through our entire section on crime prevention. The federal government sponsors a Safe Routes to School program (now embraced by several non-profits as well) that aims at removing barriers to safe walking to schools. Investigate such programs, with the help of your state highway department, local planner, or larger local transportation departments. Improvements for school kids will equal a more pedestrian friendly walkable community also. Get going, because having a walkable community is a potent ingredient in the quality of life that will attract and retain the best and the brightest of young people. Not to mention it is a key element of reliable transportation to a job in community poverty situations. Lastly, preventing childhood obesity and remedying adult obesity are incredibly important to the sustainability of the health care system. A walkable community needs to think of pedestrian safety as an indispensable part of their transportation planning program. In addition to building and maintaining sidewalks or other walkways, so that pedestrian traffic is located predictably for the motorist, it's useful to add some traffic calming measures. Traffic calming is just a piece of jargon for slowing down automobile traffic. Traffic calming can be accomplished a number of ways. Erecting barriers is common, but medians, islands, chicanes (curving medians or driving lanes), and narrowing the street are common techniques. If you have to decrease lane width for automobiles, do it. Studies have shown an 85% likelihood of dying if struck as a pedestrian at 45 miles per hour (mph), 55% at 30 mph, and 15% at 20 mph. Building sidewalks is pretty inexpensive, as infrastructure improvements go, don't you think? Like most community work, walkable community modifications will require education and emphasis. One resource we recommend is the Association of Pedestrian and Bicycle Professionals. Also check to see what your state's AARP chapter is doing, if you're located in the U.S.
And you can be recognized as a Walk Friendly community by this public-private partnership organization. It's also good to be aware of the walk score generated by various sections of your town, and to encourage real estate agents to include walk scores in their listings. The resources are many, so let's get to work on publicizing great walking routes, improving the safety and visual appeal of our best areas for pedestrians, and attacking the barriers to walking from one destination to another in our towns and cities.